HÀ NỘI — Nguyễn Huy Hoàng of Quảng Bình continued to shine at the National Swimming Championships in Thừa Thiên Huế yesterday with another new national record. Hoàng won a gold medal and broke the old national record of 1:57.51 in the men’s 200m butterfly with a time of 1:57.06. Earlier, the 18-year-old swimmer also set a new national record in the men’s 400m freestyle with a time of 3:44.92, beating the old record of 3:48.17. 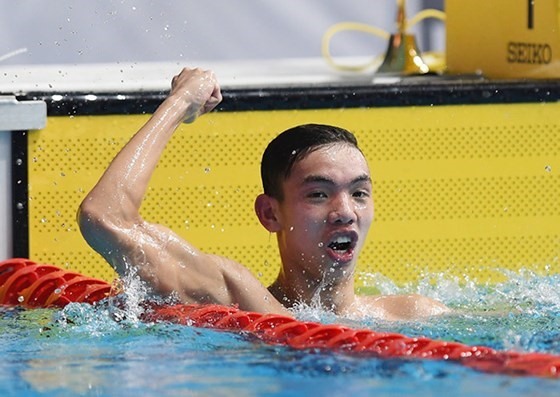 Hoàng wrote history for Vietnamese swimming following his success at the Asian Games held in Indonesia last year where he won one silver and a bronze medal in the 1,500m freestyle and 800m freestyle. In the mixed 4x200m freestyle relay, HCM City broke the old record of 7:56.82 with a time of 7:54.89. After four days of competition, HCM City top the medals tally with 12 golds, six silvers and three bronzes. Quảng Bình are in second with six golds, four silvers and one bronze, while Đà Nẵng are in third with five golds, three silvers and one bronze.